In the word-seeking stage I have learned so much. For that alone, I think my participation in the Challenge has already been a success. 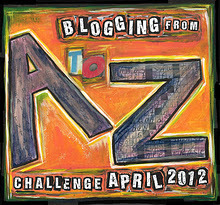 The A-to-Z Blogging Challenge is the brainchild of a blogger known as Arlee Bird of Tossing It Out. He tossed out a challenge to his readership in 2010 to see how many could post one blogpost a day in the month of April (excluding Sundays) each using a letter of the alphabet (in, you guessed it, alphabetical order) as a springboard to creativity. The Challenge has grown each year. At the moment I’m writing this, there are 649 participants signed up. It won’t be long before that number changes. Who can join? The simple answer is “anyone with a blog.” Writers do this, but so do gardeners, foodies, people who blog for fun — participation is all over the map, both figuratively (in terms of blog topic) and literally (in terms of location of bloggers). There is the opportunity to meet new people, encounter new ideas, and share some of what means most to you. I encourage you to join in! As I said at the top of this post, I have been having a great time (well, sometimes it’s been a frustrating and challenging time… glaring at “Y” as I say that) coming up with words that fit my theme of relating terms from the arts to writing, while still being true to my usual framework of Monday Musings, Wednesday Worthies, and Perfect Picture Book Fridays. Since the Challenge calls for blogging daily, there will obviously be other posts added to those. Is it April yet? 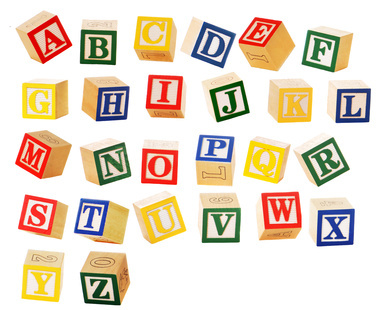 And does anyone have some alphabet blocks I could play with? Sounds like a really fun challenge, Beth. I’m always amazed at people who can blog every day. I struggle with just trying to blog once a week! Good luck preparing for the challenge. I’m sure you’ll think of something for that “y”! Thanks, Kerry! Actually, I’m planning, writing, and scheduling posts ahead of time, so I will be able to read others’ blog posts (and still get my writing done) in April. Goodluck with the A- Z Beth. Not sure I will be doing it…. Thanks, Diane. I’m enjoying it. That’s the key. enjoyment and planning ahead. This sounds fun. I’m looking forward to seeing your daily posts! I’m tempted to do something like this with my food blog, just because it would be fun to come up with yummy foods for every letter of the alphabet. oh, I’d love reading those posts, LittleM! Go for it! Hehehe! I like seeing you so excited about doing this. Good luck finding your Y! Thanks, Cap’n! This is fun — I am SO glad I didn’t wait until April and try to “wing it” though. I’d never have managed. I think I missed recognizing this post even though you told us about it in the comments, but I’m sure I’ve missed a lot. I’m making up for it by linking to this post on my next A to Z Blog Summary which will be on Saturday this week. Thanks for all of your comments and for hanging in there with us. Thanks, Arlee. I’m looking forward to the challenge — have been signing up for the feeds of some blogs already, getting in gear. We are in this together, Beth! It seems quite a challenge, and almost overwhelming, but I have learned so much already. Looking forward to connecting during the challenge!